You are kiting and you see these clouds: what do you do? Re: You are kiting and you see these clouds: what do you do? RickI wrote: We need to assume cumulousnimbus and shelf clouds have the potential to kick our butts and react defensively and early on too to land and secure. It is less clear when strong winds will be present and when they won't simply by looking at the clouds. That's the truth - you'll know more by looking at several forecasts before heading out, and be safer if you assume the worst when something pops up. Of course, ignorance is bliss, so if you don't care, then don't check the weather, just wait for the gusts to hit and then edge like a mo-fo. It doesn't help on those days when the air is ripe for storms and they can "brew up" anywhere (it only shows what is already happening), but it will show you weather fronts that have a lot of turbulence and what their track and speed are. If the wind is good but a storm front is off in the distance, you can use this site to get a fairly good idea of when the front will hit and how long you can ride and still be off the water well before it arrives. It can also be used to determine if a front is just rain (and possibly ridable) or if it may have knock-down gusts. I know i was in contact with one of these clouds now.. one kite was still up when it came.. i knew something was funky so i went in and i still had my kite up and i felt the wind shift a little and i imediately landed my kite. I grabed its leading edge and held on TIGHT, very strong gust.. i ran to my equipment and held it down. The guy who still had his kite up use the quick release right when the gust got there.. He was advanced level though. He was on the beach when he did this. This happened during an ocean session.. really good thing we were in on time, because wind started blowing offshore at 60 mph, in long island.. meaning there were no islands to be dragged to on your kite.. just the west atlantic ocean..
Last edited by naishkiter10882 on Thu Jun 12, 2008 5:37 pm, edited 2 times in total. Yeh definetly Rick, and ive tried to find more info on these clouds, but it's not explained like how you explain it. I understand more from you, since you say it in a kiting perspective. Another question about the DArk and white CLouds.. I think i understand what you're saying.. so either color they will still produce the same amount of wind? They will do the same thing? naishkiter10882 wrote: Another question about the DArk and white CLouds..
You have to think if a particularly dark, truly evil looking cloud comes along it could rain pure blowing hell down upon you. In my experience, sometimes it will and at other times not. Take the following cloud for example. As I recall there was no remarkable change in the wind as this thing passed over. It is probably the most dramatic looking cloud I have photographed. At the same time it could have pummeled us with stupidly strong, violent winds. You never know in advance. 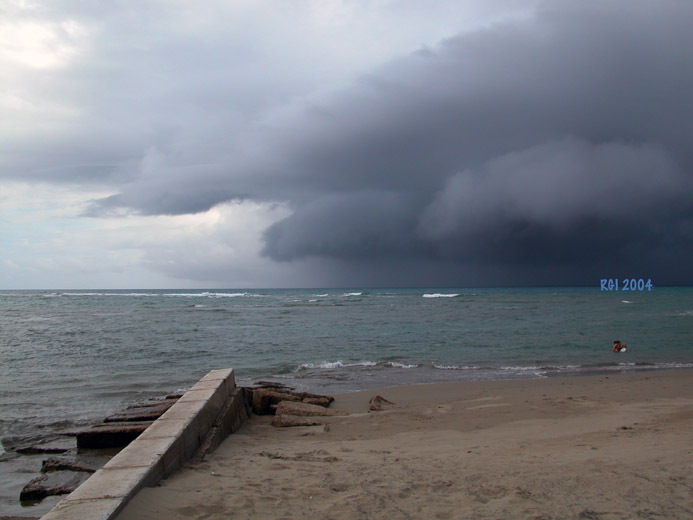 Then there was this harsh looking shelf cloud in Cabarete a few summers back. It looked pretty nasty too. In this case the wind nuked along with a deluge as it passed over. The wind had already eased a bit by this point but not the rain. 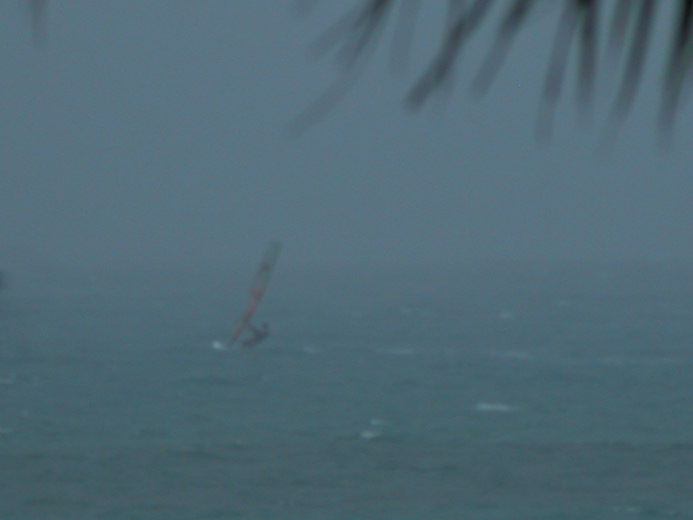 If you want to ride squalls, this is what you need to be on, if you have the skill. Duller orangoutangs can ride squall gusts on a kite into grief, takes no skill at all, just bad decisions. There was yet another time in Delray. I was out riding in overcast darkening conditions as the sun had just set. A slightly darker cloud approached but otherwise similar to the clouds that had passed before. It wasn't a cumulonimbus or shelf cloud either from what I recall. Still, it didn't quite look right either. I decided to call it a day and was driving home when it passed on to land. The wind spiked to about 55 mph for a short time. I don't want to emphasize only watching out for the really venomous clouds and ignoring the rest. We need to be concerned about excessive wind gusts and critical direction changes. Sometimes only a 20 mph gust, even less at vulnerable moments can be enough to cause harm. We need to routinely do weather planning, monitoring, learn about local conditions and act with reasonable caution. To do otherwise is to act like grazing cows in the field angling for that random lightning strike. Haha, thanks a lot Rick you're the best! Check out this spike last Sunday when a thunderstorm passed. I was out and was lucky enough to have gotten back in just before it hit. Blew down trees and light posts, was amazing. Not sure what would have happened if I was out there. This was near NYC at around 5 pm? Were you at Plum Beach or out on the Island or ? It hit pretty hard at around that time at Bayville as well. The radar shows the system just as it passed east of Long Island. Looking at the time, it must have been moving pretty fast at this point. The storms showed up a bit west a few hours early. Pays to check radar and realtime winds upweather too. Otherwise, just think about those cows in the field oblivious to that pending lightning strike. Hey, wonder if we can do something about that, at least set them up with iPods if not Internet access? Thank for passing this along. Glad you weren't out in this with a kite up. naishkiter10882 wrote: I know i was in contact with one of these clouds now.. one kite was still up when it came.. i knew something was funky so i went in and i still had my kite up and i felt the wind shift a little and i imediately landed my kite. I grabed its leading edge and held on TIGHT, very strong gust.. i ran to my equipment and held it down. Rick, to answer your question, pilots of all aircraft, from a small Cessna up to the size of an Airbus 380 avoid cumulonimbus (CB) clouds at all costs, I've seen some that have reached 70000ft. I've been at 45000ft flying around these things and looking up at them. We usually try to avoid them by at least 20 miles. The turbulence inside them caused by severe updrafts and downdrafts can rip the wings off an airplane, not to mention the hail damage. The greatest danger is on landing and takeoff. That nice 10kt headwind can quickly turn to a 25kt tailwind, robbing an aircraft of lift. Thats just in the vicinity of a thunderstorm. They can also produce microbursts which is a vertical downdraft. It's been known to flatten trees.